The 3 free online Swing dance moves below will introduce you to the exciting East Coast Swing dance style. In this dance be sure to do the correct foot work through out all the moves - This will help you ensure that you can stay "on time" even when the music is really fast. The Swing has similarities to dances like Cha Cha and Salsa. the most simple way to count the Swing if you are just starting out is Rock step, triple step, triple step. Later on you will want to count it as 1 2, 3 a 4, 3 a 4. You can also count in 8s when you have more than 6 steps. The most important to note in the beginning is that both steps in the rock step are full beats so you must fill them out. Here is the 1st basic step of Swing dance. This move consists of a rock step and 2 triple steps. Men be sure to lead the ladies into the rock step every time. 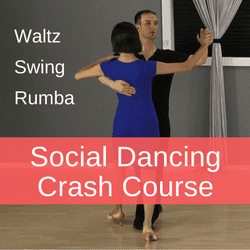 Learn the basic steps of 3 popular Ballroom dances: Swing, Rumba and Waltz. Get the confidence you need to dance with your partner at weddings, parties and social events. Learn individual moves and combinations with ease. Watch it online on any device. In this lesson you will be learning some technique that is essential for the Swing. We will be breaking down the footwork on each step. The rocks step is using ball flat action. Followed by the ball of the foot, flat and ball flat for the triple steps. In this Swing video you will learn how to to go from the regular closed position to gt into one hand hold - or what is called open position in dancing. It is imperative that you learn this because if you want to do any kind of turn you will need to start it from an open hold. 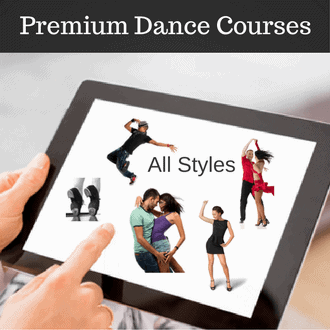 Want More Latin & Ballroom Lessons? Become a member at Passion4dancing.com and get access to over 250 video lessons teaching you Latin and Ballroom dancing (American & International Style). We hope you enjoyed learning how to Swing dance! If yes please share this page with your friends and leave a comment below.